ATTENTION! 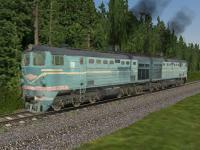 FOR CORRECT USING OF THIS LOCOMOTIVE YOU NEED TO DOWNLOAD CABVIEW #1 FOR 2TE10L VERSION 1.1 OR NEWEST AND SOUNDS FOR TE10! 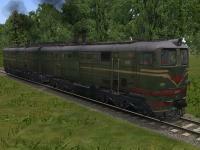 2TE10L engine was developed in 1961 in Lugansk locomotive factory (aka Voroshilovgradsky Zavod im. Oktyabrskoy Revolutsii, VZOR). Locomotive was based on earlier TE3 platform and designed as a substitute for less powerful TE3 serie. They were produced in between 1964 - 1977. Total 3670 units were built. 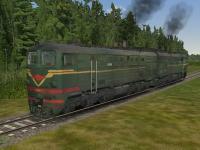 2TE10L or "Luganka" served in many railways of USSR and ex-USSR countries as freight locomotive, in some regions also hauling passenger trains. Most of them were retired and scrapped in nineties, and now it's a rare thing. IT'S NECESSERY USING 2TE10L LOCOMOTIVE! For change variant of cabview go to folder [MSTS]\Trains\Trainset\tsrLoco_2TE10L-Alias\Cabview_1 and click to file tsrCab_2te10l_night.bat (change variant of cab to night) or tsrCab_2te10l_day.bat (сhange variant of cab to day). There are two variants of locomotive signalization in the cab: for routes with Russian signalization (which is in development) and with foreign signalizations. For change variant of signalization go to folder [MSTS]\Trains\Trainset\tsrLoco_2TE10L-Alias\Cabview_1 and click to file tsrCab_2te10l_alsn_rus.bat (for routes with Russian signalization) or tsrCab_2te10l_alsn_foreign.bat (for routes with foreign signalizations). ATTENTION! 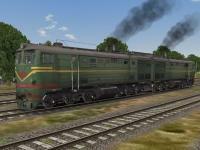 FOR CORRECT USING OF THIS LOCOMOTIVE YOU NEED TO DOWNLOAD CABVIEW #2 FOR 2TE10L & TEP10L VERSION 2.0 AND SOUNDS FOR TE10! The model painted like its prototype 2TE10L-1351 in the 1990s, when it works at Morshansk depot of Kuybyshev railroad.